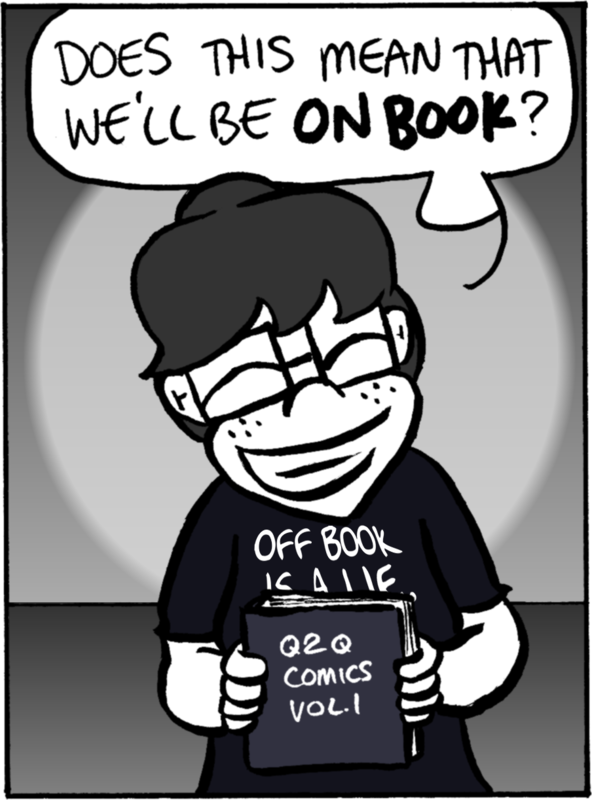 Announcement: A Q2Q Comics BOOK?! Yes! You heard it right. Q2Q is finally going to be ON BOOK, or well, in a book. It’s going to be a collection of the first 200 strips, plus concept art, commentary, and some super secret art just for the book (shhh!). To get the book printed, we’ve launched a Kickstarter campaign! The goal is to raise $12,000 to be able to print and ship 2,000 copies of the book by March of 2016. If you back the Kickstarter, you can get your name into the book itself as part of a list of amazing people backers! You can also pre-order the book through the campaign, and get it signed or have your favorite Q2Q crew member doodled on it. You can also get comic prints, or a drawing of you in the style of the Anatomy comics, or come see a show with me! Many of the rewards are limited, so if you’ve got your eye on one, you’d better act quickly! I am so excited to finally be able talk about this! Please check out the campaign! This entry was posted in Kickstarter, Shop and tagged kickstarter, q2q shop. Bookmark the permalink. ← Don’t Forget to Submit Your Entries for the Costume Contest!